Formula One chief Bernie Ecclestone said he aims to bring the motor-racing series to Russia by 2012 and New York by 2013, in a move to have up to 20 events in the Grand Prix calendar. Formula One will most likely be held in the Russian capital of Moscow or in Sochi, site of the 2014 Winter Olympics, while at least three places have been identified for a circuit outside Manhattan, Ecclestone said. This info is from Bloomberg. Formula One is quite popular in Russia (my brother is huge fan, and doen’t miss a single qualification or a race), and Russian fans have had hopes for Moscow to get onto the F1 series calendar for years. The location for the stadium outside of the city has been selected, and, if I’m not mistaken, even the construction has been started. However, no finalized plans and dates were ever stated, and I don’t know where this project is. There have been talks about F1 and Moscow’s government not agreeing on how to split the profits. This season, for the first time ever, a Russian pilot, Vitaliy Petrov, is participating in Formula One, as one of the Renault drivers. Btw, if you are flying Aeroflot this April, check out his interview in their onboard magazine. 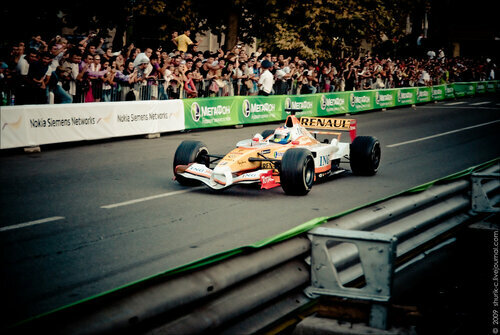 Formula One has already been to Sochi, last year with exibitory race. It was Renault who brought it’s cars to Sochi. Here are some pictures from that event. The Nissan Russian Adventure 2010 got underway with the opening ceremony yesterday in Sochi. You can follow the event – blog, videos, photos and results are available – on the official website. The Fifth winter music conference SWMC 2010 is to take place in Sochi Marins Park Hotel conference hall on February 4 to 7. The conference is known as the most significant forum for both music industry professionals and electronic dance music amateurs. Its traditional format will comprise two-day business forum and rich three-day music program involving all Sochi club sites. The conference will gather well-known show business figures, professional music journalists, showmen and DJs, producers, sound producers, promoters, night club and record company owners and managers, event managers, radio and TV presenters, booking agents, brand managers, festival organizers, and representatives of other spheres in music industry. Dozens of special music events, planned to take place during the conference, will give a chance to colorfully spend the week-end in the form of a non-stop party and enjoy a great variety of electronic dance music genres. As part of SWMC extensive night program, around a hundred Russian and foreign DJs and musicians are meant to perform at the event. It is these parties that yearly attract electronic music and dance club culture amateurs from all over Russia and neighboring countries. Participants and guests gladly spend February first week-end at SWMC special parties and Sochi night clubs, which is a sure indicator of SWMC contribution to event tourism development in Russia. 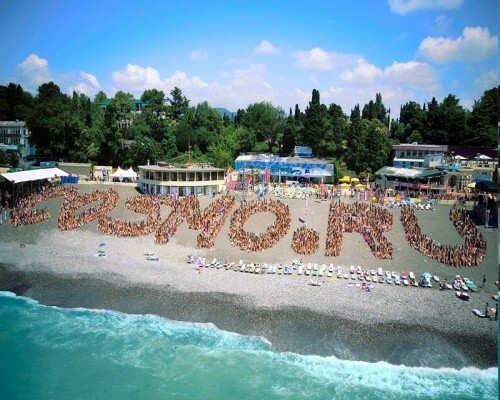 Last month Sochi hosted finals of the Beach Volleyball European Championship Tour 2009. Here’s slide show from the event. Nissan Russian Adventure 2010 (formerly known as Nissan Caucasus Classic) is once again coming to Sochi on January 21, 2010. Nissan Russian Adventure will take place at the ski resort Krasnaya Polyana in the Western Caucasus. Krasnaya Polyana is the host of the alpine and nordic ski events of the 2014 Winter Olympics with Sochi as host city. Sometimes called the “Russian Courchevel”, Krasnaya Polyana is the most sophisticated ski and snowboard resort in Russia, located just 45 minutes from the Black Sea, and well known as President Putin’s favourite holiday resort. 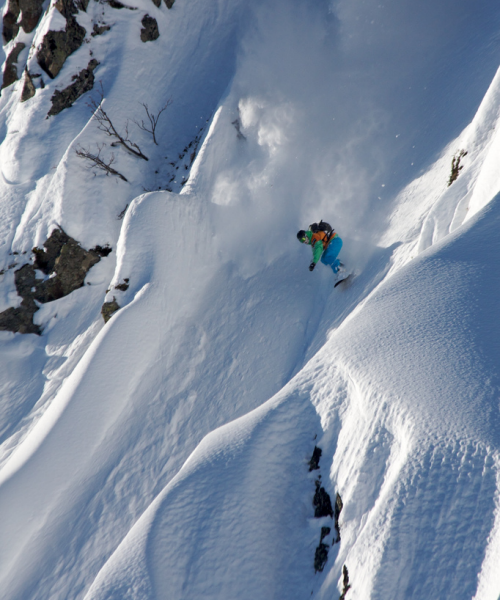 It is also famous for its awesome heliskiing in the spectacular Caucasus mountain range. The contest is organised by renowned Russian extreme skier Nikolay Veselovskiy, who is also chief heliskiing operator in the area and pioneer of heli-skiing in Kamchatka. For the qualifying run the contest will take place at the actual Krasnaya Polyana Mountain very accessible for the public. 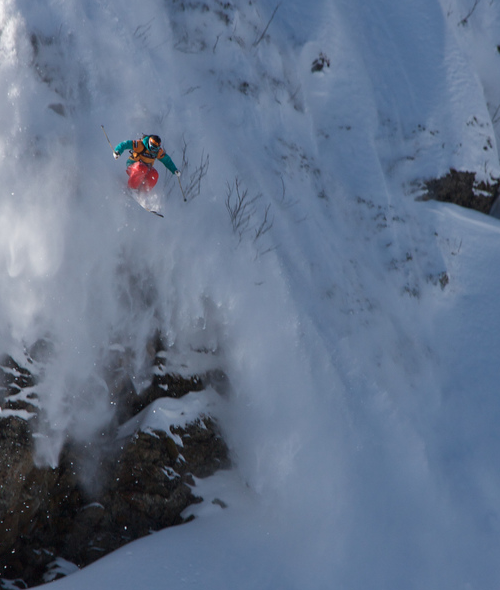 The final run with 22 riders will be held on another peak with heli access. The exact peak will be determined depending on where the best snow conditions are to be found. The snow quality is quite unique in the area as the great proximity of the sea produces a characteristic snow that sticks to the steepest angles. As mentioned above, a five day event in the Sochi region will be run from 2009 onwards. The resort area is the location for the 2014 winter Olympics and holding a top-level cycling event there is part of the Russian government’s plan to tie other sporting events in with this. The drive to have a ProTour race goes all the way to the top; Prime Minister Vladimir Putin was involved in that and will send his deputy PM Alexander Zhukov to supervise the race. The latter will act as the chairman of the race organizing committee. For many years the area has hosted the GP Sochi, a 2.2 race which was held in April of this year. This will remain, with a new event in the same area being added to the highest rung of the calendar. «Sochi has been having its own race for the last 55 years. We are going to leave it there and have this ProTour race separately,» Gusyatnikov said. «The plan this year is to have a trial race, running from the 10th – 14th of September. Then next year the new [ProTour] race will be held. The first edition of the race will be five days long and is pencilled in to take place from May 20th – 24th. It will be developed over time, with additional roads being built in the area for this purpose. It may also become longer in duration, depending on how the first few editions go. 19th Open Russian Film Festival Kinotavr 2008 will take place in Sochi on June 7 – 15 this year. The official website is kinotavr.ru (Eng), and you can read my article with photos about last year’s «Kinotavr 2007» here. If interested to go, shop around, at least for the air fair, as prices listed on their tour website are pretty crazy. During the same time — June 5-10 — Sochi will host 75-th Russian international cinema-market (Kinorynok or Kinorinok). This biggest event of the Russian and xUSSR republics’ film industry takes place three times a year, twice in Moscow (March & December) and in Sochi. It attracts over 1000 representatives from film studios, distribution companies, film producers, creative groups, movie theatres, and companies producing wide range of equipment and services for the film industry. Geographically, these two events will be happening very close to each other, right in Sochi’s center. WBFK World Champion Anatoly Nosyrev (RUS) will meet Kelly Leo (USA) for the ISKA Kickboxing World Championship Superheavyweight title fight in Sochi on August 17th. Russian Thai Boxing Federation has applied to host 2008 European Thai Boxing Championship in Sochi, Russia. Sochi has strong Martial Arts traditions, for example we have one of Russia’s best Muai Thai clubs – «Atlan». Several of Atlan students have become Russian and European champions in Thai- and kickboxing. Also, Sochi often (every year?) hosts finals of the Russian «Pankration» (aka “Russian Absolute” – Russian version of UFC) Championship. Wow! As you can imagine the news media of all sorts as well as regular people in blogs and forums are talking about our Olympic bid’s success. The win’s Pros and Cons arguments seem even more heated than before the vote: new infrastructure vs environmental worries, higher salaries vs high inflation, pride and recognition vs prospects of weaker foreign policy, ability vs inability to complete construction on time, international spotlight vs corruption – you name it, its been talked about. Whose shares went up? What will happen to people who live in and around the areas of constructions? What will happen to the “Olympic” money? Will the Olympics be profitable? Will it become’s Putin’s project for the upcoming years (after he leaves office next year after second term as President)? Both optimists and pessimists know all the answers, and they are completely opposite :) The truth, as always, lays somewhere in between. But everybody agrees – making this Olympics a success is a big exam for Russia. I’ll try to avoid covering the arguments about all this questions as right now all of it is just speculations and personal views, and will stick to the facts. So, how did Russia react to Sochi’s win? Mostly with shock and cheer! A lot of people, even the one’s who really wanted the win, did not believe in it. I’ve read that Russian betting offices lost over 10 million rubles (~$390 000). Betting is not that popular in Russia, but the point is they burned on this. A lot of people feel pride (so do I :)), and most are lost in guesses on how and how much this will change Russia’s South, and people’s lives. July 5th (because of the time difference, it was 5th in Sochi when results were announced in Guatemala) will very likely become an official holiday in Sochi, this idea is already being proposed by Sochi’s mayor, Viktor Kolodyazhny. Russian businesses celebrated this victory with enthusiasm and introducing “olympic” sales. For example Russia’s biggest online store ozon.ru introduced 20% off almost all items for purchases on July 5th ans 6th, several travel agencies introduced lower rates to Sochi for those who’ll order next 10 days, “Ural airlines” introduced special “Olympic” rate for people going to Sochi for it’s development — from construction workers and engineers to sportsmen and their trainers, etc. “Kinotavr” film festival open in Sochi! «Kinotavr» is Russia’s biggest open film festival. It takes place in Sochi annually, this year its 18th time. The opening ceremony took place evening June 3rd. There are fourteen moves in the competition program; they’ve been selected from over 100 films. Most of the participating movies are Russian (only one foreign move is Ukrainian), you can find the complete list of the titles at the official website’s program page. Over 70 companies from Russia presented their services during «Hospitality and recreation industry» exhibition which is taking place in Sochi. Also, the Third Open Sochi Culinary Championship will be part of the exhibition, and will have prizes for “Young chef” (for students of culinary schools), “Perfect chef” (for professional chefs), and “Art-class” (for cooks and pastry-cooks).